Legalized sports betting will introduce a flood of capital into the markets. Don't miss out! Yesterday, I explained how the Trump Supreme Court’s decision to legalize sports betting has ushered in a tremendous, new opportunity for investors. I explained how – just like the marijuana boom – the legal sports betting boom is expanding quickly to several states, and how the opportunity is expanding, too! Today, I’m going to show you how big the market for sports gambling really is, and how some of the biggest players in sports betting are already spending a ton of money to get ready to expand their businesses! I’m very confident this is one of the biggest money-making opportunities you’ll see in years. That’s why I’ve produced an entire online presentation on it. You can view this presentation, learn more about this opportunity, and discover how to access my list of “super elite” dividend-paying stocks by clicking right here. Whenever I notice a new investing opportunity, I always look at exactly “who” is behind a trend, as that is one of the key factors in determining both longevity and overall investing potential. For example, if a trend is reliant on the baby boomers, it could flourish in the shorter term since they have large chunks of cash at the moment. However, those folks will undoubtedly cut back on spending in the coming years as they approach and get farther into retirement. The exact opposite is true of sports gambling. The numbers tell us this is a young man’s game. A poll of prospective sports bettors (pending legalization in their states) found that 69% were men and 38% were between the ages of 18 and 34. In short, millennial males are the driving demographic for sports gambling. As millennials start to earn more money in the decade ahead, they will have more disposable income. Plus millennials are all about experience versus “things,” and betting on sports definitely qualifies. I’m not a millennial, but I think all of us sports fans agree on how fun it is to attend a game and root for our favorite team. With the introduction of in-game gambling, the experience gets taken to yet another level, so let’s look at that. Imagine sitting down in your seat to watch your favorite baseball team. You have a cold beer in one hand and a hot dog in the other. You have a feeling the next batter will hit a home run, so in addition to proclaiming your prediction to your fellow fans, you set aside your beer, grab your phone and open an app to place a $10 bet that will pay off big should he indeed send one soaring out of the ballpark. Or how about sitting courtside at the NBA Finals as the Philadelphia 76ers are poised to win the championship. But instead of betting on the outcome of the whole game, you place a wager on your phone that NBA star Joel Embiid makes his next free throw. Swish. The $50 bet just paid for your food and drinks for the evening. Whether this sounds like a dream if you’re a sports fan like me or no big deal if you’re not a sports fan, it is a big deal for us as investors. This opportunity to place bets even as a sporting event is being played could be a reality in a few short years. In-game gambling, also referred to as in-play betting, will enhance the experience of attending or watching sporting events and lead to a ridiculous boom for gambling platforms. The Las Vegas Lights of the United Soccer League became the first team to sign a sponsorship deal with a bookmaker when the minor league soccer team made large U.K.-based William Hill its official sports betting partner earlier in June. William Hill will promote its online gambling platform at the Lights games to allow attendees to place bets throughout the game. Not only will the experience forever be altered at the actual sporting events, but William Hill already has plans to offer in-game gambling at its sportsbooks. The Ocean Resort Casino is expected to open its doors this summer in Atlantic City with William Hill running the 7,500-square foot sportsbook. 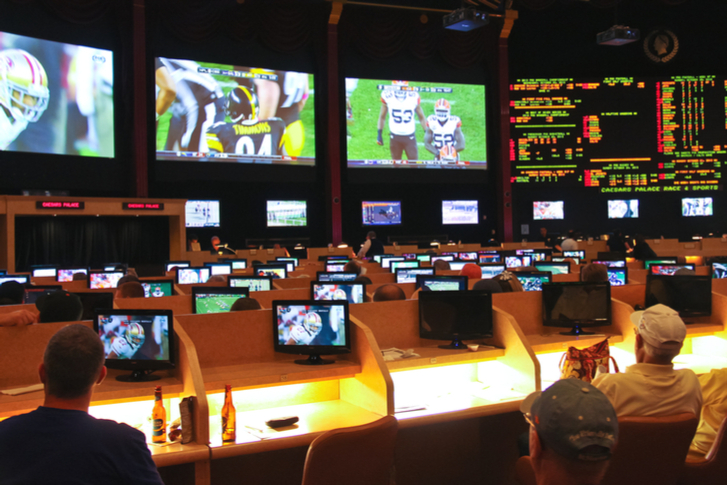 Along with traditional sports betting options, there will also be in-game bets that gamblers can place as they watch the games on the big screens. There are no more important players in this trend than the professional sports leagues and teams that are being wagered on. Without the leagues and the teams, it will be impossible to place a wager, so they want in on the action. I am not yet sure how this will eventually play out, but I am sure money will be thrown their way. There is also indirect upside potential. When a consumer has skin in the game, you know they are going to watch more of it. An overwhelming 92% of current sports gamblers say they are more likely to watch a game when they have a bet on it. Of course. Wouldn’t you? Well, the more eyes there are on a game, the more money a league can bring in from advertisers. And as I already highlighted, male millennials will be the majority of the audience. This is a coveted demographic that advertisers spend big bucks to get in front of. I think it’s a very smart bet that the leagues will figure out how to profit. The owners are some of the wealthiest, most powerful people in the country. They didn’t get that way by passing up chances at big money. The owners of professional sports teams and the heads of the major pro leagues are ready to line their already rich pockets. You can get your share of this money too as part of the Great American Sports Betting Boom. The potential for expansion of sports gambling into fantasy sports is another exciting factor in this trend. The nearly 60 million fantasy sports players will have the opportunity to legally place wages on their games, or perhaps bet which player will end the day with more fantasy points. That’s like giving candy to a child. According to the Fantasy Sports Trade Association, fantasy players spent an average of $653 in 2017. That number could greatly increase with the addition of practically unlimited wager opportunities. The $38.7 billion spent by fantasy sports players is only the start of what could easily turn into a $100 billion industry in the next decade. Adding to that potential is the natural crossover from fantasy sports to wagering on sporting events. Surveys show that half of fantasy sports players also bet on sports. Fantasy sports were always legal, but the betting wasn’t. Now, a father of two in Mississippi can place a bet on his favorite college football team without fear of breaking the law. I cannot stress how big this fact is for fantasy sports players around the country. Online fantasy sports leader DraftKings has been preparing for the game to change. In 2017, the company was actively hiring and planning for the inevitable and is well on its way to becoming a major player. With nearly 10 million customers already, DraftKings can go directly to its database to expand into sports gambling. The world’s largest daily fantasy sports mobile platform already has the consumer protections and technology in place to scale up to the next level. In fact, shortly after the SCOTUS decision, DraftKings announced that it struck a deal with Resorts Atlantic City and filed for a sports betting license in New Jersey. There were also reports that the company had an investor meeting and decided to raise up to $200 million to help support this major move into sports gambling. The other big player in the fantasy sports world is FanDuel, which is also setting itself up to profit from this trend in the years ahead. The CEO even made a comment that he expects revenue from sports betting to eclipse that of fantasy sports at some point. FanDuel made its first move in late June, when it was chosen by the Greenbriar Casino in West Virginia to handle the sportsbook at the resort. FanDuel will provide retail, online and mobile sports wagering services. This is the first such deal for FanDuel and a look into what could be the future for the company. The Greenbriar-FanDuel hookup was made possible after it was announced that UK-based bookmaking heavyweight Paddy Power Betfair plans to acquire FanDuel. The deal is expected to be completed in the coming months with the new combined company ready to roll out sports gambling. The marriage of a company that already handles sports gambling with a company that has a large presence in the digital world of fantasy sports is a no-brainer. We may well see more of these in the future. Both companies have their sights set on launching before the NFL season kicks off and are updating their current platforms. They have also acknowledged potential competition in the niche industry, but this is to be expected and not feared. I am more than okay with new competition entering the fray because it will mean more opportunities for us. Tomorrow, I’ll explain the powerful business model – one of the best on the planet – that makes me so bullish on sports betting. In fact, I’m so bullish, I produced an entire online presentation on it. P.S. Hot trending opportunities – like marijuana stocks, and legal sports betting – don’t come along every day! You can click here to view my online presentation about how the new sports betting law is going to create a bonanza for investors. Article printed from InvestorPlace Media, https://investorplace.com/2018/09/your-chance-to-cash-in-with-legal-sports-betting/.